His Voice Makes Perfect Sense? My husband had received an unusual email from a man in our city that we hardly know. The man wrote to explain that he was having visions of horses and must speak to my husband right away. He further explained that the visions were true because God had confirmed the vision of the horse... drum roll please... by a stork. What? A stork? That doesn't make sense! You can understand why we would have a good laugh at that and completely ignore the man's prophetic vision. First of all, we hardly knew him and his checkered background didn't help his credibility. Secondly, his explanation didn't make sense to my husband's logical mind. Although we didn't follow up with it, the man's saving grace was that I too had been having visions of horses. I just didn't know why. As the story unfolded, another prophetic word came to my email box from a well-known prophet. This prophet was also having visions of horses, had much more credibility, and he could give a reasonable interpretation. It was about a specific nation that I've been dreaming about bringing the Gospel to. I was elated to receive this prophetic vision because that nation's government had closed it to Christianity. We finally solved the riddle of the horses, but why the stork? I still don't know, but there is a growing company of prophetic people who hear and see the voice of God in things that ordinary people can't or won't connect to. They will see or hear the voice of God in the cloud formations, in the way the wind is blowing, in the Major League baseball scores, or in the sounds of the cars honking on the road. It's not something they make up. It's really the voice of God speaking to them and in their world, it makes perfect sense. We see stories like this all throughout the Bible and it leaves most of us in holy awe and wonders. Consider the time when Elijah kept sending his servant to look at the sky as he prayed for a cloud to appear "the size of a man's hand" (1 Kings 18:44). 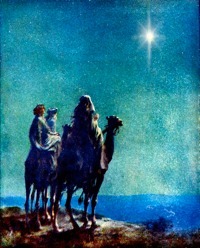 Then there was the time when the wise men journeyed to find the baby Jesus to worship Him (Matthew 2). I gave my life to Christ my first year of college. I had a great honeymoon in the Lord but needed serious deliverance about a year later. It was all connected to my Mormon upbringing and some occult activities I participated in out of ignorance. I went through a rough season of deliverance as a result but found real freedom and authority in Christ. Two things happened after I was delivered from those spirits. I received a highly-sensitive gift from the Holy Spirit for discerning of spirits (see 1 Corinthians 12), and I also began having visions. I should clarify that I was already connected to the spirit realm as a non-believer and did see spiritual things quite regularly. What was happening now in the Holy Spirit was much different. After my deliverance, it appeared I had been given a hefty spiritual package but it was heavy and too much spiritual information. It made me feel crazy instead of gifted and took years to learn how to walk it through. One of the first things the Holy Spirit did was to train me personally how to see the visions. I needed to focus my spiritual eyes on things that mattered and not get distracted by the volume of activity going on in the spirit realm. I believe this is what the Prophet Daniel meant when he said he was watching and looking at the night visions in Daniel, Chapter 7. As He was teaching me, the Holy Spirit would highlight someone or a situation and then ask me two questions. He would ask me, "What do you see?" I would tell Him. Then He would ask me, "What do you know?" He wasn't referring to what I could see or know naturally. I was supposed to answer Him with information past my natural knowledge. We would go back and forth on that drill several times a day and did so for several years. I began to realize soon enough that I was dialing into things with just enough accuracy to make all of us uncomfortable. Later I found this same communication in the Bible as the Lord questioned both Jeremiah and Amos asking them, "What do you see?" (See Jeremiah 1:11 and Amos 7:8). It's common for me to have an experience in God only to find it quite clearly in the Bible much later. Even if it takes a long time, I always look to the Word to prove my experiences as legitimate. I believe this is an important communication pattern to follow. Logical people who don't see or hear into the spirit realm need more evidence that what is being revealed to you is coming from the right place. Visions and seeing into the spirit realm are part of your spiritual gift package in the Holy Spirit (see Acts 2:17). Many people have visions but don't know they are having them. Let's say, for example, you are driving down the road and see a homeless person on the street. For a moment you feel sorry for the person, but decided to not to help them for a lot of reasons. In your mind's eye, you suddenly see yourself picking up a sandwich at the nearby sandwich shop and bringing it to them. The scene plays so quickly in your imagination that you barely notice it and then your rational side persuades you to dismiss it. What happened to you, however, as you just had an internal vision from the Lord. You were being directed by the Holy Spirit to help feed this man. You failed to recognize it because it happened so quickly, and you dismissed it as just being "your imagination". The place in your mind where you imagine things is also the place in your mind the Lord draws His pictures on to instruct you. I've learned to pay attention to those seemingly insignificant internal movies and act on them. God is very much speaking to you through it. Did you know that Jesus received His directives this way? This is what is behind His statement to the disciples in John 5:19 when He said He only does what He sees the Father doing. Basically, Jesus was receiving visions from the Lord and it was how He planned His day and His ministry activities. Like all the gifts of the Spirit, visions can be accessed by faith. If you don't have visions or struggle to see into the spiritual realm, you can kick-start visions by going through the doorway of the Word. Let me explain how. One day I was reading Psalm 8, meditating very deeply on it, and my spiritual eyes switched on. I could see Jesus standing right there in front of me. I knew that transition happened simply because I was meditating on His Word. Over the years, I've helped people step into visions through this same process. In the activation, you find a scene from the Bible and fix every detail of the scene into your imagination. I suggest you use the throne room scenes, such as those found in Revelation 4 and 5. Once you have fixed every detail of that scene into your mind, you ask the Holy Spirit to breathe on it and then surrender your imagination to Him. In your imagination, you can walk right up to Jesus on the throne and ask Him your questions. This typically results in having those short, internal visions like I described previously, but some will have external ones. The way you test that vision is, by the way, He answers you. If it's real, He'll answer you in ways you couldn't make up yourself. It does take some mental discipline, but this process works well with people who are too logical to have visions, or with people who need to feel very grounded before they can surrender their mind like that. I believe the Lord wants to train all of us to see in the spiritual realm. There are some things that can't be explained outside of a vision. Think about in natural terms. How can I describe to a blind person what the color red is? It's impossible! You have to be able to see the color in order to understand the color. Visions are the same way. They help us to more fully understand the Word of the Lord because we can see what He is saying. One thing I can say about this lesson is that they are real. and if you received a vision it's perhaps God had you on His mind, sometimes if your in a place that's not in the Will of God He will Bless you with what is called a moment of Sanity that through visions or some other Divine way would show you that you don't belong in that place and to remove your self . But without that vision that came in the form of a warning we would not see that we are living out of the Will of God. Praise God for another Spiritual lesson. This is a topic you don't hear preached or taught in the church , but it's a subject i experienced from time to time. One vision I really remember was when i was working at the Philadelphia International Airport and it was very early on Resurrection Day when I looked out of the landing on Terminal A East on the Pavilion and a voice inside of me said "Look Up" and when I looked up I was shown the formation of the clouds and how they was all the same size and the same color which was multi-colored but the reddish orange was slightly dominate and it was very Amazing none of the clouds was out of sequence and how straight they were frontwards and sideways all was straight and the same size and it was a constant flow no cloud was out of sequence and the speed of the clouds was one speed as if they were being pulled and the voice within me said 'EVEN THE CLOUDS HAD TO COME WITNESS THE RESURRECTION OF THE LORD JESUS CHRIST AT THE TOMB' It was an awesome vision that I would never forget .The Word says in the last days the Holy Spirit will be giving many visions and dreams. “In the last days” God said, “I will pour out my Holy Spirit upon all mankind, and your sons and daughters shall prophesy, and your young men shall see visions, and your old men dream dreams.” (Acts 2:17) Visions are a special and unique way of hearing from the Lord. 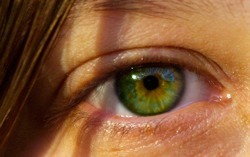 Some speak of vision as a general term, as in visualizing a future perspective, or goal. .A Biblical vision is a literal, spiritual and sometimes a physical happening. It’s not a product of the mind, imagination or logic. Receiving a vision is a gift from the Lord: Another type of vision is seen on the screen of the mind and can happen with the eyes closed or open, sleep or awake. They come in the form of a movie rather than a quick photographic flash, similar to viewing still slides or a moving movie reel. Coming through the mind, it is like recalling something from memory, but what is recalled is a surprise not yet known. The “Vision” floats into the mind, all the while the viewer is fully conscious and aware of his or her surroundings. “...Peter went up on the housetop to pray, about the sixth hour. Then he became very hungry and wanted to eat; but while they made ready, he fell into a trance...” (Acts 10:9-10 NKJV) Peter fell into a trance and saw the same vision three times about the Gentiles. (Acts 10:10-16) Obviously God wanted to get Peter’s attention. Peter had a preconceived opinion about the Gentiles that God wanted changed. It is recorded again in Acts 11:5-10. Also Paul had this kind of trance vision while in prayer in Acts 22:17-21. There are times He literally opens our senses. We encounter the “real” hearing in our flesh. Elisha prayed for the Lord to open his servants literal eyes so he might see the real issue of what was taking place with the angelic hosts. 2 Kings 6:15-17 NKJV And when the servant of the man of God arose early and went out, there was an army, surrounding the city with horses and chariots. And his servant said to him, "Alas, my master! What shall we do?" So he answered,"Do not fear, for those who are with us are more than those who are with them." 17 And Elisha prayed, and said, "LORD, I pray, open his eyes that he may see." Then the LORD opened the eyes of the young man, and he saw. And behold, the mountain was full of horses and chariots of fire all around Elisha.In daily living, man is not usually gifted to have the eyes to see the angels at work. Elisha obviously knew what it meant to have the Lord actually open his eyes so he might see... There are other experiences I encounterd in the form of visions that I will later mention in upcoming lessons. I thank God I learned a lot from this lesson and what stuck out to me was A Biblical vision is a literal, spiritual and sometimes a physical happening. It’s not a product of the mind, imagination or logic. Receiving a vision is a gift from the Lord: an experience of sight, not the imagination. Thank God for this Eye Opener. Lord help me to recognize your voice and not dismiss it thinking it was just my own feelings and really listen to your voice and get me out of the way.